I finally was able to save enough money to buy myself a Silhouette machine from Quickutz. I bought a used model of the classic version. I am pretty happy with it so far. I still have LOTS to learn on it…but thankfully since I have already quite a bit of graphic editing experience with Corel PhotoPaint and Adobe PhotoShop, the learning curve isn’t so difficult to keep up with. I also have a WONDERFUL darling husband to thank who can show me tips and tricks related to using a digital cutter since he works with an industrial-sized one at work. Since the Silhouette can use any True-Type font, there are so many possibilities out there. One of the GREATEST things about the Silhouette using True-Type fonts is that there are a lot of shapes available to you also. If there is a dingbat font that you LOVE LOVE LOVE…then I will tell you more about how to use this for your Silhouette machine and teach you a few tricks that you can use in your digital scrapbooking too! If you are using the RoboMaster software, and you are trying to find a neato dingbat using a TT Font, it may be a little difficult to see the graphic that you want to use from that font. This is where the CHARACTER MAP comes in super duper handy! 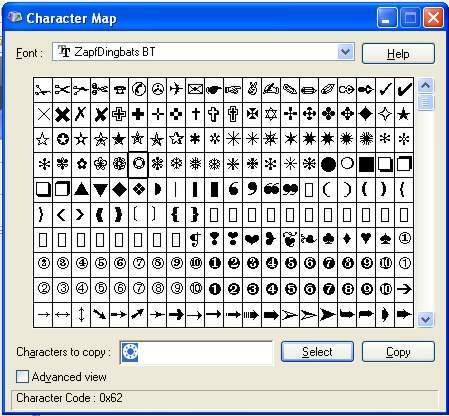 The Character Map is part of Windows Software and is a separate little program that can be opened up. I can’t exactly tell you where it is because many of us organize our files on our computers differently. However, if you press the WINDOWS key, your START MENU will come up and you can click on ALL PROGRAMS. From there you will mostly likely find the CHARACTER MAP program under the heading ACCESSORIES. When you open up the Character Map program…you will be able to choose a font that you like and it will show all the characters available in that font. For example if I was using the Dingbats font…all the dingbats that are available would show up on that Character Map. I feel that the Character Map program has a drawback in that you can’t resize the window to get a better view of the characters that are available. However, if you click on a square that has a character in it…it will bring up a larger view of the character. If you want to choose a different font, click on the pull down arrow where it says FONT and choose the font you want to use. If you want the graphic in that character set…double click on it OR click on the graphic you like and click the SELECT button. The graphic will now show up in the Characters to Copy box in the program. From this point…highlight the graphic in that same box and click COPY. This will now copy the graphic onto your clipboard for easy pasting. If you haven’t already opened your RoboMaster software, do so and start a new file. When you are ready, you can do a CTRL-V for pasting into the program, or choose EDIT and then PASTE. Your graphic will show up on the screen. From here, you can resize it and manipulate it however you like and then cut the graphic as usual. PRETTY COOL eh??? Now…if you are doing digital scrapbooking…the CHARACTER MAP can come in handy for that too as you can do the same COPY and PASTE into your graphics editing program. You will be amazed at how many COOL dingbats are out there for you to use and now you’ve increased your Silhouette graphics library at the same time because you can save those graphics as a GSD file for future use.